into inquiries, leads, and new business. It's not just about getting traffic to your site, but what happens once visitors reach the site. It's critical that your web site turns visitors into inquires, qualified leads, and new business. We can evaluate the ability of your web site to persuade your visitors to take action and recommend modifications to the structure and content of the site to help improve conversion rates. Improving conversion rates on a web site can really pay off. Most companies see returns of from $10 to $100 for every dollar invested in conversion rate improvements. Conversion Rate: The percentage of your web site traffic that takes the action you desire - Whatever that action is. For some it's an immediate sale, for others it's an inquiry or a newsletter subscription, and for some it's a phone call or future visit to their facility, etc. We call the art and science of building a compelling web site Conversion Point Architecture. Building upon the science of Usability and Psychology, it takes advantage of web technology and requires an understanding of how web behavior differs from conventional buying behavior. The goal is to insure that the site delivers an effective persuasive path (some refer to this as a conversion funnel), provide a successful branding experience and communicate the appropriate messages. User Experience and Conversion Point Review. Building on a User Experience and Conversion Point Review we may suggest further site testing and possibly site redesign. Typically we perform “user tests” on the existing site, redesign prototypes, or competitor sites for functionality and Conversion Point Architecture. Conversion Point Architecture during initial site design or relaunch. Video testing includes personality profiling and learning styles testing of candidates to improve results. Additionally we can perform comparisons with competitive sites as well for further insights. The video recordings are delivered complete as recorded as well as highlights videos which deliver selected activities to demonstrate areas of the site which have room for improvement. We can improve the conversion rates of your email marketing campaigns, increasing the percentage of readers who make a purchase or an inquiry (or whatever the goal of the email campaign may be). The email message links the reader back to a web site where they can take some action. It should be a web site that you can make changes to within a reasonable timeframe (ideally one where you can make changes very quickly). Or you do a large quantity email blast and have the ability to send the messages in batches over a period of a month or two so we can make changes for each batch and watch the results in order to make systemic improvements. We design or redesign web sites using Conversion Point Architecture Design to dramatically improve conversion rates. It's a much different approach than the typical site design process - See Web Site Design/Redesign for more about Conversion Point Architecture Design. ROI Calculator Download: Calculate the Potential Return on Investment from Improvements in Web Site Conversion Rates (an Excel Spreadsheet). Case Study: Moving contact form produces less leads, but higher quality leads. Case Study: Adding “calls to action” to move visitors along to a Conversion Point. Form Confirmations Can Make or Break the First Impression, blog post. Building a Sign up Page that Converts, blog post. 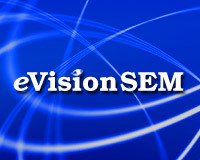 The eVisionSEM Blog for more posts. Ready to have eVision improve yours site's conversion rate? Call us at 203.481.8005 or use our contact form.